Today I have a fun project to share with you from Leadership. 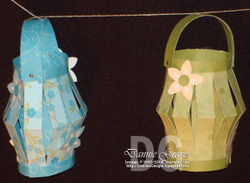 Carrie Cudney demonstrated how to make these cute paper lanterns. Here's how you make them. Start with a 6" x 9" piece of Designer Series Paper. With the 6" side going across the top, score your DSP at 1/2", 3", and 5 1/2". Fold your DSP in half along the 3" score mark and open it back up. Decide which side of the DSP you want on the outside of your lantern, and have that side facing up. 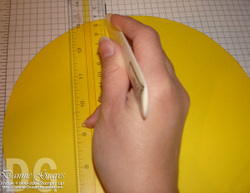 Fold along the 1/2" and 5 1/2" score marks. Adhere those two flaps down using sticky strip. Your DSP should now look like this. Rotate your DSP so the 9" side is going across the top. Cut slits every 3/4" from the top flap down to the bottom flap. Do NOT cut through the 1/2" flaps you just glued down. After you're done cutting slits, add sticky strip down one side and glue the two ends together to form your lantern. For the handle you need a 2 1/4" x 6" piece of DSP. With the 2 1/4" side going across the top, score your DSP at 3/4" and 1 1/2". Fold it into thirds along the score lines and adhere it together using sticky strip. 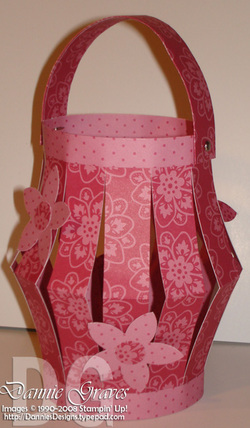 Attach it to the lantern using a 1/16" hole punch and silver brads. Finish off your lantern by adding some flowers. 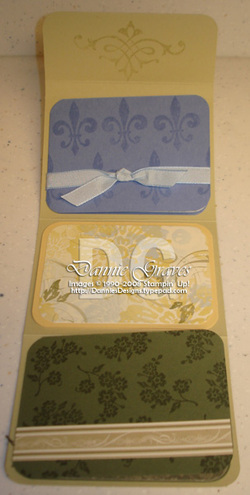 Carrie used the Stitched Exotics stamp set for her flowers. Since I don't have that set, I used my 5-petal punch and punched some flowers out of matching DSP. For the center of my flowers I used the 1/2" circle punch. I used dimensionals to adhere the flowers to my lantern. There you have it. Another quick, cute project. Thanks Carrie! This week has been a great stamping week for me. First, I got to be a guest host for the "Try a New Technique" challenge on SplitCoast. My challenge was to try the "Dahlia" fold that I featured on my blog here and here. The cards that people have been posting are AMAZING!! Check out the gallery submissions here. As always, I'm blown away by the talent of so many stampers out there. Second, I received the "Great Tip Award" from Laurie for my 2, 4, 6, 8 box and for my Valentine Card. Thank you Laurie! 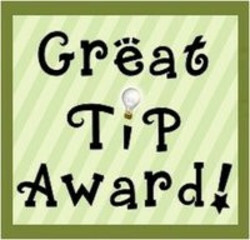 As part of this Great Tip Award, I get to give this award to 3 other blogs. All 3 of these ladies are really talented and I love looking at their blogs. They have great tips, great ideas and great blogs. A couple of weeks ago I was visiting a neighboring town and I had about half an hour before I needed to be anywhere. So I went into Michaels...just to look! I didn't "need" to buy anything, I just needed to pass the time. 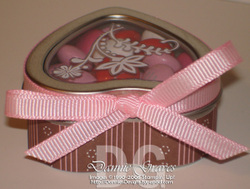 I was looking through all of their Valentine crafts and I saw a box of the cutest tins...and I caved. Isn't that cute? Can you blame me for buying them? I used one of our new Eastern Elegance Rub-Ons on the lid. It took me less than five minutes to decorate this tin. I used sticky strip to glue the DSP and the ribbon onto the sides (I placed the seam of the DSP at the top of the heart). The box came with 30 tins so I have lots of these to play with. I just can't say "no" to tins that I can alter! I've never tried the "Featured Stamper" challenge at SplitCoast before, so I thought I'd give it a try. 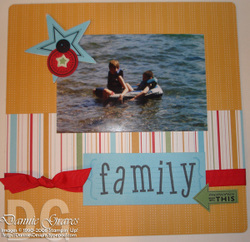 I looked through StampingPam's gallery and chose this card to copy. I wanted to use my new Hattitude stamp set and Pam's layout was perfect to work with. 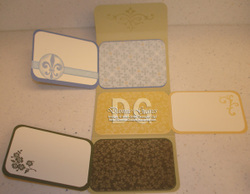 I changed the colors of cardstock used and the stamp set, but I left the layout the same. 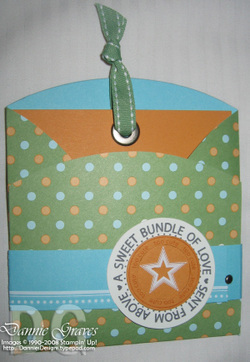 I love the way the ribbon is threaded through the punched circles on either side of the card. After I tied my ribbon, the circles were still sticking out quite a bit from the card. I added a dimensional behind each circle and that helped hold it together a little better. So...am I on the only one who likes this set? I went over to SplitCoast and my card is the only one in the whole Hattitude gallery!!! My little card is feeling all alone over there. If you have this set, would you please make a card or two with it and add it to the gallery? I would love to see more fun ways to use this set. 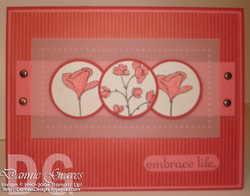 And for those of you who haven't tried the featured stamper challenges--you should. Having a layout done for you already makes stamping go so much faster. I was amazed at how quickly this card went together. Why does it feel like my kids are getting older, but I'm staying the same age? I still feel like I'm 24! My daughter will be having her birthday soon, so I needed to make her some birthday party invitations. 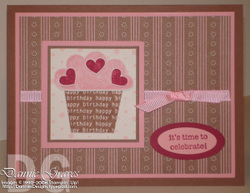 I went through my Berry Bliss DSP and picked out the striped/polka dotted piece and designed my card around those colors. I also added some Berry Bliss DSP behind the cupcake. Both the "frosting" on the cupcake and the hearts are popped up on dimensionals. It was a lot of cutting, but I love the way it turned out. As soon as my daughter saw her invitations she said, "I like those mommy because girls LOVE hearts!" Yes, they passed the test! Today's project comes from my December downline meeting. Donna designed this photo wallet for all of us to make. You can download the pattern here. 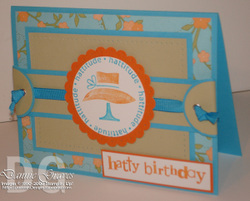 I like the way she layered the 5-petal flower punches on top of the scalloped circle. It frames the flower perfectly. On the bottom Always Artichoke panel, Donna glued down a strip of the Le Jardin DSP. It had never occurred to me to cut this piece of DSP into strips and use it as accents. This is the wallet completely open. It has lots of spaces to add photos. I'm going to turn mine into a mini brag book of my children. Recently friends have been asking me for updated pictures of my children and I don't have any with me. This should solve that problem. I belong to such a talented group of demonstrators. I've only posted a couple of the projects we've done at our meetings here on my blog. There are so many other great projects we've made--not to mention the swap cards. Want in on the fun? We'd love to have you join us too! Contact me for details. Today I wanted to share a fun project we just made at my last downline meeting. Kathleen taught us how to make Coaster Post-it Note Holders. The base is a 4" square coaster that we covered in mod podge. We placed our DSP on top and sanded all the edges. We took a small piece of DSP and mod podged that to the front side of a binder clip and tied ribbon on top. 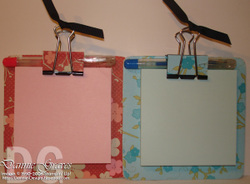 Open the binder clip and clip the post-it note pad to the coaster and it's finished. That's as difficult as this project is to make. Kathleen even managed to find small pens to coordinate with our DSP. This original idea was shared by Angie Juda on SplitCoast. There are so many fantastic ideas on that site, there's just no way to see them all. Kathleen, thanks for finding the idea and sharing it with us. When I first saw the Embrace Life stamp set, I wasn't sure if I wanted to buy it. Then I saw all of the wonderful samples people were posting using the set...and I caved. I had to have it too. I used this card as my inspiration. I stamped the images in Basic Gray on Confetti white cardstock and colored them with my Cameo Coral marker. 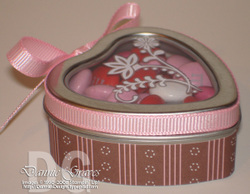 I used the Word Window Punch on the Ginger Blossom DSP so the Cameo Coral layer beneath it would show through. Then I stamped my saying in the hole. I love the neat, clean lines of this card. Here's a tip for lining up the Word Window Punch. Use the punch on a piece of computer paper. Take the punched piece and glue it on your DSP right where you want it. Turn your punch upside down and line it up over the computer paper and punch it out. For you visual learners, here's a photo. Now line up your punch over the computer paper and punch. Thanks for stopping by. As soon as I saw the new Berry Bliss Designer Series Paper, I knew I had to order it. 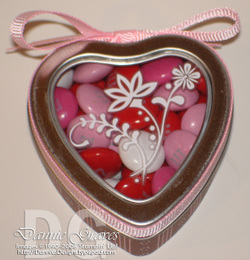 I love the combination of pinks and chocolates. I had some new stamps that I wanted to use this weekend, so I grabbed my Berry Bliss DSP and headed to SplitCoast to see what the latest sketch challenge was. It was perfect for the One of a Kind stamp set I wanted to use. I embossed the main floral image in black embossing powder and cut two of them out. I layered them on top of each other so the back petals peeked out between the front petals. I also used my new Boho Backgrounds stamp set. 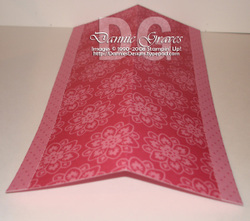 It's the little floral print on the Pretty in Pink layer and at the top of my card base. Isn't that pretty? It's such a delicate background stamp. 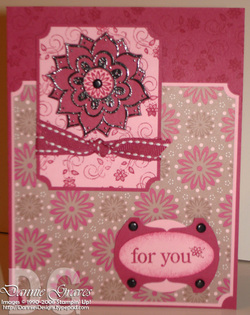 If I hadn't made this card myself, I'd think the Pretty in Pink layer was DSP. I'll be using this stamp a lot! I was so proud of myself for coming up with this card and then I went and peeked at the rest of the sketch challenge cards. Would you believe my card looks similar to Laurie Schmidlin's (see her card here)? I didn't see her card until after mine was done. Doh!! I posted my leadership make-n-takes last week (click here to see the post), but I have a couple of things to add as well as directions for one of the cards. First is my scrapbook page. I thought it looked a little bare without a photo on it and the star just floating on the page. Here it is again with a photo. That looks much better! I also mentioned that it was glued onto chipboard. What I didn't realize at the time is that it's our new On Board Book Basics chipboard. Let me tell you...this stuff is THICK (almost an 1/8" thick) and sturdy!! I will definitely be ordering some of this on my next order. Here's the card that needs directions. 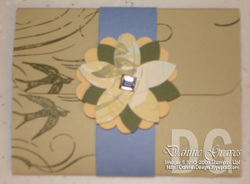 The base of this card is made from a piece of our new East Coast Prep Designer Series Paper. 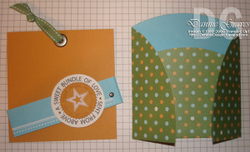 Take a piece of the 12" x 12" Wild Wasabi polka dot DSP and cut off a 1" strip. 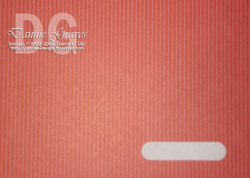 Cut the strip down to 1" x 10" and set it aside (this is the belly band for the card). Next you need this piece from our On Board Ginormous Pieces. 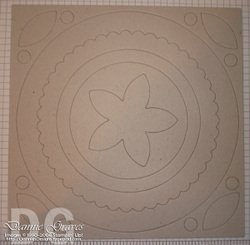 Punch out the largest circle from the chipboard and use that to trace a circle on your DSP. Then cut out the circle. 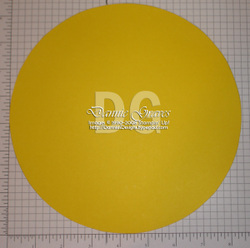 Edited to Add: For those of you who don't have this chipboard, the circle is 8 1/2" across. 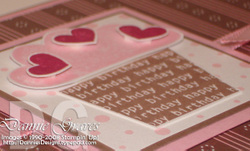 I'm using some yellow paper for this tutorial...just pretend like it's the gorgeous DSP from Stampin' Up! Next you need to score your circle at 3 1/2". To do this, I took a pencil and marked a heavy line along my 3 1/2" mark on the grid paper from the bottom of the paper to the top. That way I could see the heavy line at the top after I placed my circle on the grid paper. Lay your circle on your grid paper making sure to line up the left and bottom sides of the circle with the edges of the grid paper. 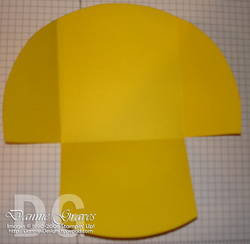 lining up the folded edge with the bottom of your grid paper. Now you need to score two more lines just like you did before. One at 2 1/8" and another at 6 3/8". Fold it on the new score lines. Now cut out the two smaller pieces of the circle following the score lines. When you're done it will look like this. Fold the bottom flap in first and then the two side flaps. That's it for the card base. You don't need any adhesive to hold it together--that's what the belly band is for. Grab your 1" x 10" strip that you previously cut. Score it at 1 3/4" and 6". Fold on the score lines and adhere the ends together making sure the longer side is on top. Slide the belly band onto your DSP. The card insert is a 4 1/8" x 4 1/4" piece of More Mustard cardstock. Punch a hole in the top with your crop-a-dial and set a large eyelet in the hole. Tie a ribbon through it and that piece is done. We decorated the belly band with some rub-ons and the Sweet Celebrations stamp set. 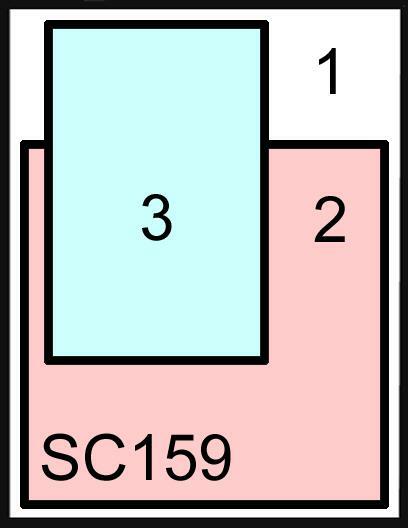 Here's a picture of all three pieces of the card together. This was my favorite card that we made at leadership. Have fun making one!